I have now been able to get a picture with Bart Yasso on two occasions. 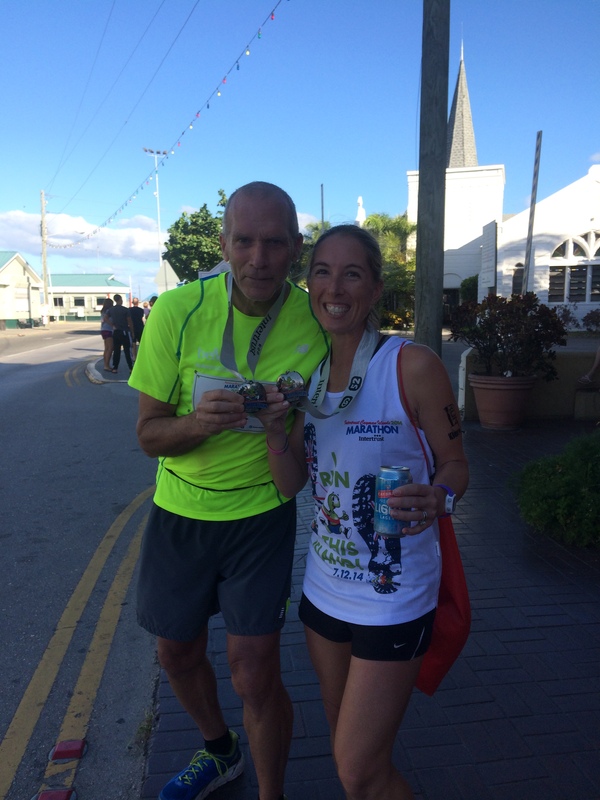 I really had no idea who he was at the first race, the Cayman Islands Half Marathon in December 2014, when I heard him speak, although I had a pretty good idea of his importance in the running world after his talk! I simply saw him at the end of the race, asked if we could get a photo together, and I went on my merry way. 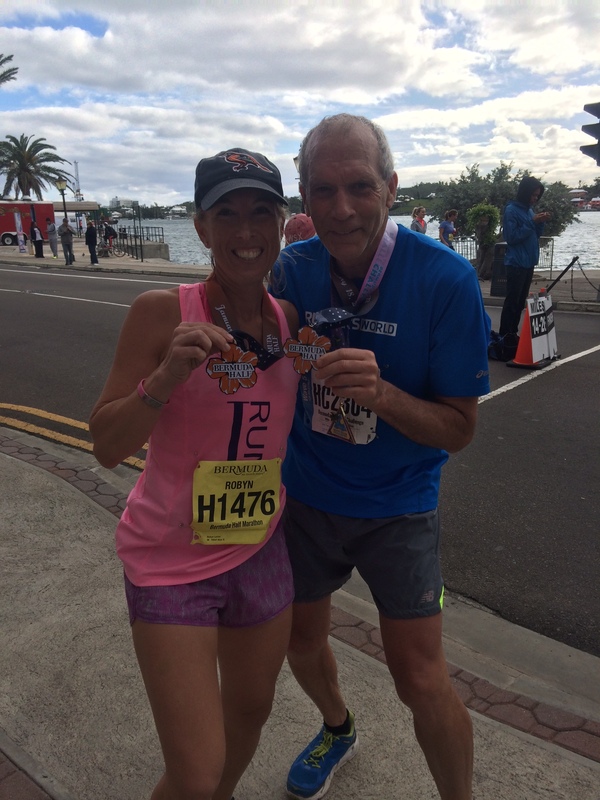 I posted it to my facebook page, and quickly, I had ‘real’ runners talking about how I was lucky to meet ‘running royalty’ at this race. Then I did a bit of homework on Bart and what he has done for the running world. Wow. I indeed have a friend in a high place. Not only is he the Chief Running Officer at Runner’s World Magazine, he has contributed so much to the running world. He invented the Yasso 800s, a marathon-training schedule used by thousands around the world to help predict and train for marathon finish times. He ihas completed races on all seven continents from the Antarctica marathon to the Mt. Kilimanjaro marathon. He won the U.S. National Biathlon Long Course Championship (1987) and won the Smoky Mountain Marathon (1998) in 1998. He has competed in the Badwater 146 Ultramarathon through Death Valley and is a five-time Ironman finisher. He has also done more colorful, fun races, such as the Bare Buns Fun Run (see his memory of this race here), and he often runs shakeout runs at races sponsored by Runner’s World Magazine. He is a member of the Running USA Hall of Champions. And it was a bit by luck or chance that I again saw him at the Bermuda Half Marathon in January 2015. I knew he would be there, but when you have more than 1000 people involved in an event, you may or may not see them. But see him I did, and it happened at the start of the race, as we were running by Parliament on Front Street. I jogged with Bart for about 2 min, re-introducing myself as one of the people he met in Cayman the previous month. We had a fun chat, but I was ready to pull a bit further ahead, so I took off, and wished him well on the course. Fast forward a bit over 2-hours, I was at the finish line, talking to my husband and cheering on those who were coming in, I saw Bart Yasso cross the finish line to many cheers. At this point, I was trying to make my way to a rest room and change from my sweaty running clothes into dry clothes, and in the process, stopping to chat with many people I knew from Bermuda. After a while, I was able to continue, when who did I see about 0.1 mi from the finish line, cheering the runners on? Bart Yasso! So we walked up to him, and I was able to get another picture, both of us with our finisher’s medals around our necks. We chatted more and I joked that I wondered where I would see him again. We decided it was only the cool places that we both had the chance to run, and I continued on, knowing that at some point I will be able to ‘run into’ Bart another time. Turns out I was right. He will be at the 40th annual Marine Corps Marathon. And I very much look forward to being able to take yet another picture with this member of ‘running royalty.’ Thanks Bart, for all your encouragement to this new runner. It is nice to have people who are so high up take time for those of us who will never win a race, who struggle to finish these personal challenges, and who will never make a name for ourselves in the sport. It is because of experienced runners like you who are so supportive that I am encouraged to keep on running! Very cool story. I love the people and adventures we get to share through each others’ stories.